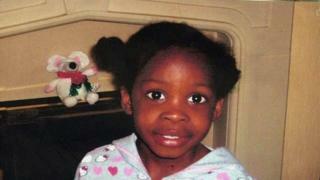 A firm has been fined £50,000 after a six-year-old girl was crushed to death by an electric gate. Cheshire Gates and Automation Ltd admitted corporate manslaughter at an earlier hearing after Semelia Campbell became trapped in Manchester in 2010. She had been running back and forth between the moving gate and a wall outside her Moss Side home. Her mother Judith Gilroy said she would "never forget the fear in my daughter's eyes" when she was trapped. "Although today Cheshire Gates have been brought to justice, it is my family and I that have paid the ultimate price," she added. Manchester Crown Court heard the schoolgirl become trapped between the gate and a post while she had been playing with a friend as the gates opened for a car on the evening of 28 June 2010. Semelia was freed following "considerable" efforts by her family and the emergency services, and taken to hospital but never regained consciousness and later died. A joint investigation by Greater Manchester Police (GMP) and the Health and Safety Executive found that the company's actions "directly led" to the six-year-old's death. Firm director Kriston Kearns installed the gate with an employee. The gate should have been tested to ensure it would stop and move back when there was an obstruction, GMP said, but programming carried out by Kearns had effectively over-ridden safety features, which meant the gate kept closing "with a force of more than a quarter of a ton". Prosecutor Mr Andrew McGee said Kearns, 43, had not known how to set the gate up to a safe standard and that he and a co-worker had failed to read installation manuals. John Michael Cooper QC, who was defending Cheshire Gate Automation Ltd, said the firm had no input in the gate's design and it had been advised that there would be no pedestrian access. Alison Norton, Specialist Prosecutor from the Crown Prosecution Service (CPS) said: "This tragedy could have been avoided had the gate been automated correctly. By its plea the company has accepted that it had been grossly negligent in breaching its duty towards Semelia and has accepted responsibility for her tragic death. I hope that this is of some comfort to Semelia's family." Det Supt Peter Marsh of GMP said: "There are no winners in this sad case", adding Semelia's death was "totally avoidable".